Patanjali Ayurved Ltd. has come out with a wide range of products in the Indian market, claiming to be all natural and cheaper than their competitors. 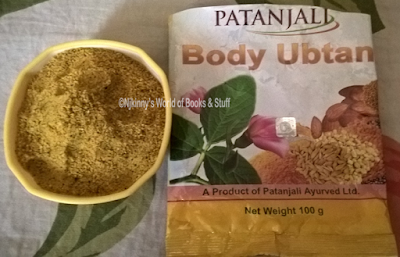 I have been using several of their products since the past several months and today will be sharing my review of Patanjali Body Ubtan. Patanjali Body Ubtan consists of the below natural ingredients. Shelf Life: 1 year from the date of manufacture. 1) Is made of all natural ingredients like Turmeric, Almond, Red Lentil etc. which are all known skin care ingredients that have been used since ages in preparing ubtans (body packs) and known to not only remove any spots and blemishes but also make the skin fairer and healthier. 2) It is decently priced at 60 INR for a 100 g pack which is cheaper than the other ubtans present in the market. 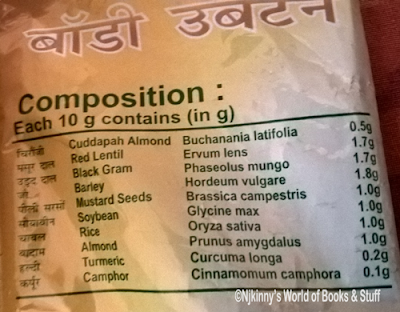 3) Easily available in the market in the various Patanjali and several normal stores too. Also available online. 4) No extra ingredient apart from the ubtan powder and water is needed to make the paste. 5) The powder makes a fine paste and is easy to apply and use. 6) It has a normal pleasant smell that we associate with ubtans with a slight pungent smell of camphor that is not so strong as to cause irritation. 7) The ubtan works on all types of skin and I saw a definite improvement in my skin. It got shinier, more healthy looking and also fairer. 1) The camphor smell, though light, can be irritating to some people. 2) The ubtan is a coarse powder and so even when mixed in water and applied can still rub the skin raw if scrubbed too hard. All in all, I loved using Patanjali Body Ubtan and saw noticeable difference in my skin. Recommended to everyone from me, I know I will be buying this product again! 4 out of 5 to it from me, go buy, use and experience Patanjali Body Ubtan's effect on your skin yourself! 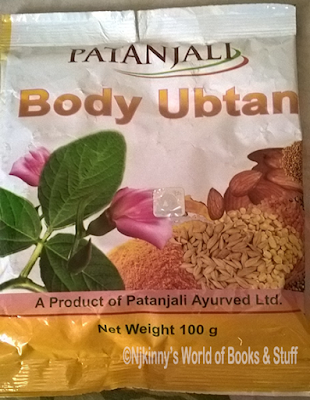 Have you used Patanjali Body Ubtan? Is this a product that you will try? Share your thoughts and views with me in the comments below. I love hearing from you.